Our Holy Father Dionysius, a native of Vologda, was one of the greatest ascetics of Russia’s Northern Thebaid, and had links to some of the most important figures of Russian monasticism, including Saint Cyril of White Lake (June 9), whose portrait he painted. Saint Dionysius spread Saint Cyril’s tradition of inner spiritual activity and love for the poor throughout the northern regions of Russia. He also combined within himself the Athonite traditions of his elder Saint Dionysius with those of Saint Sergius of Radonezh (Sept. 25 & July 5). His spiritual father was Saint Dionysius the Athonite (Oct. 18) who later became the Archbishop of Rostov. It was this saint who tonsured the younger Dionysius as a monk at the Spasso-Kameni Island Monastery, bestowing his own name upon him because he had such a great love for him. After nine years he left the monastery, with the blessing of his Elder, and went with his disciple Pachomius to a remote area known as Saint Luke, because once there had been a monastery in that place which was dedicated to the Holy Apostle and Evangelist Saint Luke. The two monks built a church and dedicated it to Saint Nicholas. 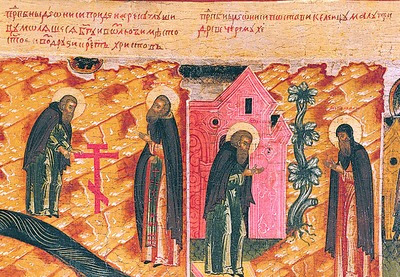 Desiring even greater solitude, Saint Dionysius left Pachomius at Saint Luke’s one day in 1393 and went deeper into the Vologda forest so that he might not be deprived of an opportunity for ascetical struggles. That evening, he decided to rest for the night by the Glushetsk River. As he slept he heard the ringing of bells, which he took as a sign that he should build a monastery there. Saint Dionysius made a crude shelter for himself near a bird-cherry tree - the small, black cherries contain tannin and have a bitter-sweet taste, for this reason they are sometimes known as choke cherries, or hackberries. Saint Dionysius used to give these cherries to those who were ill, and they would then become well. Soon disciples began to gather around the Saint, not only men, but also women who thirsted for God. As disciples began to gather around him it became necessary to build cells to accommodate them. A local prince ordered woodsmen to clear a spot for the building of a monastery. Monastic cells were built, and also a small church in honor of the Protection of the Most Holy Theotokos. The number of monks increased, and one night Saint Dionysius had a dream where he saw a young man who told him to build a larger church. The man told him that he would always have the protection of the Mother of God. In the morning, after Matins, he informed the brethren of his dream, and told them that they should obey the young man’s instructions. The church was built, and was adorned with icons painted by Saint Dionysius, who was an accomplished iconographer. 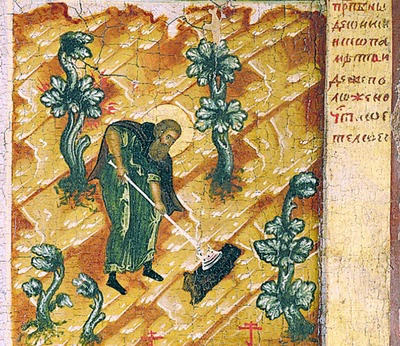 His icon of the Dormition, which was a wonderworking icon, was given to the Monastery of the Seven Hills, which had been founded by the Saint’s disciples, and was also located by the Glushetsk River. In 1407, Prince George Boktiuzhinsky expressed his wish to donate funds for the foundation of the Glushetsk Monastery. Saint Dionysius would not allow him to do this, but he did bless him to provide food for the brethren. 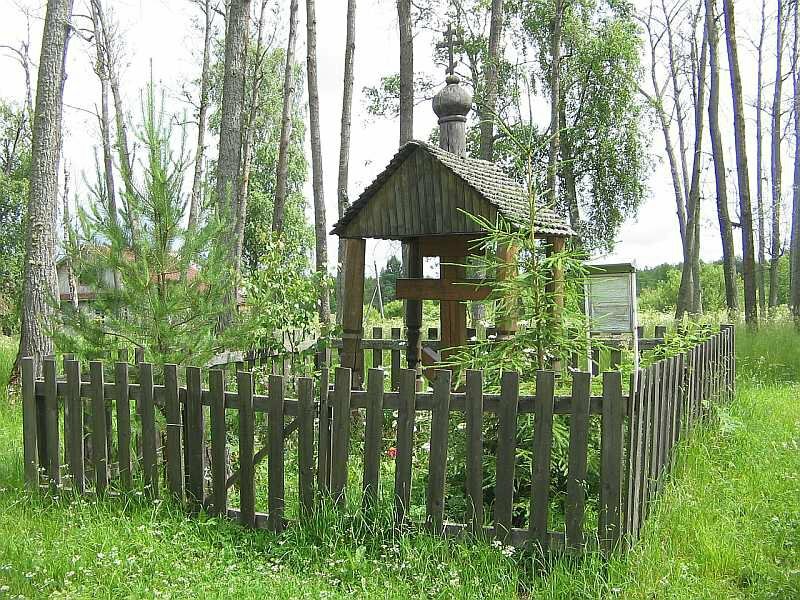 When this monastery became too crowded, Saint Dionysius found an isolated place called Sosnovetsk (so named because of the large, very old pine tree which grew there) on the banks of the Glushetsk River. There he built a church in honor of Saint John the Baptist, and a few cells for those who also desired greater solitude. The righteous one increased his ascetical efforts, standing in prayer all night, and living on bread and water. He even dug his own grave. Once he told the brethren that they were to remain at that place, but only if he was buried there. He assured them that if they stayed, they would have their reward from God. If he was not buried there, however, he declared that they should not remain. In time the Glushetsk Monastery was abandoned, but monks continued to live at the Sosnovetsk Monastery until recent times. Saint Dionysius was the first to establish a women’s monastery with an Athonite typikon. After a visit to Rostov, where his Elder Dionysius was now the Archbishop, he returned to his monastery and established a women’s monastery near him, dedicating it to Saint Leontius of Rostov (May 23). The monastery flourished and was a model of the monastic ideal for women. During a time of famine, Saint Dionysius gave alms to all who came to the monastery for assistance. When the number of people increased, his almsgiving also increased. Once the steward informed him that the monastery’s supplies were almost depleted. Saint Dionysius rebuked him and said that their almsgiving would be a great help to the monks on the Day of Judgment. Giving to the poor, he said, was like lending to God Himself. 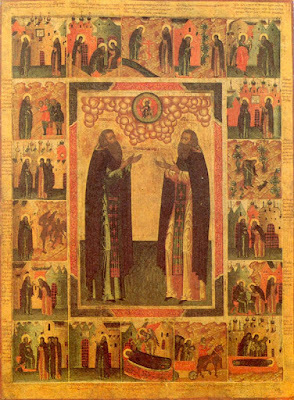 Before his death, he named his disciple Saint Amphilochius as his successor. He also heard the voice of the Mother of God, promising to protect the brethren of the monastery from every evil and necessity. The Saint’s final illness began on May 29, 1437 and it was revealed to him that he would die in three days. Early on the morning of June 1, he asked his disciple Saint Macarius to serve the Divine Liturgy so that he would be able to receive Holy Communion for the last time. After the service he called the brothers to him so that he might give them his final blessing and bid them farewell. At 6:00 A.M. his face shone with a divine radiance, and peacefully he surrendered his soul to God at the age of 74. The cell was filled with an ineffable fragrance, and Saint Amphilochius saw a crown on the head of his spiritual father. Many of the disciples of Saint Dionysius also became abbots of other monasteries. 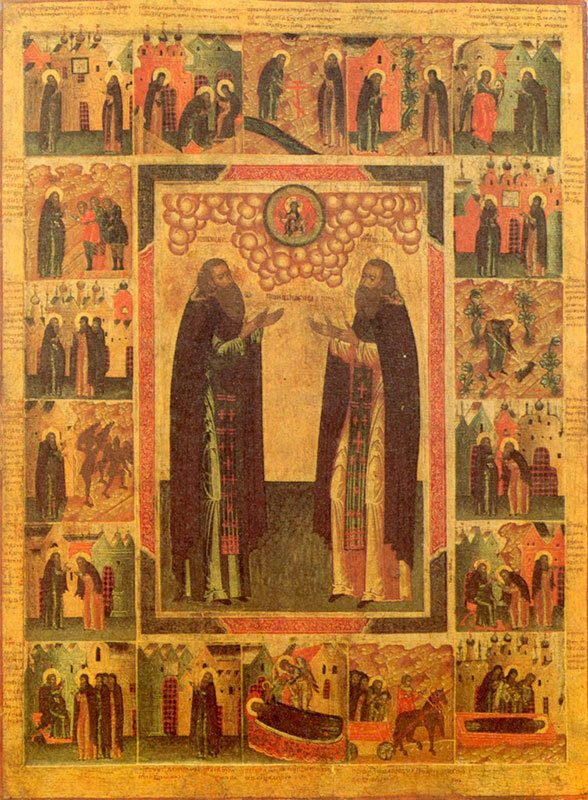 Among them are Saint Amphilochius of Glushetsk (Oct. 12) who reposed in 1452 and Saint Gregory of Peshma (Sept. 30). This latter holy wonderworker fell asleep in the Lord in 1451. He and Saint Dionysius had such mutual love that they seemed to be of one mind. 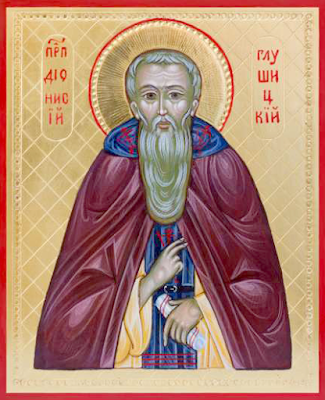 Saint Dionysius told him, “Do good while you have the time, be true in glorifying God and doing His will.” Saint Macarius of Sosnovetsk (Oct. 12 & May 13) was also a disciple. He completed the course of his God-pleasing life in 1480. Saint Dionysius was buried at Sosnovetsk, in accordance with his desire. Through his holy prayers, may we also be found worthy of the Kingdom of Heaven.